Did you know that my first airplane ride was through Philippine Airlines? How can I forget, it was a solo trip bound to Manila from Legazpi. I was too afraid that I even asked the flight stewardess who was very nice to teach me how to fasten my seatbelt! Also, if you are a regular reader, you may remember that I recently got 2, 500 Golden Circle points from Shangri - la Hotels which I am going to convert as airline miles through PAL. It was a part of a hotel hack I have discovered and just doing the last process which is an overnight stay to its sister hotel. I am talking about a series of free flights so I'm seeing lots of trips with Philippine Airlines soon! 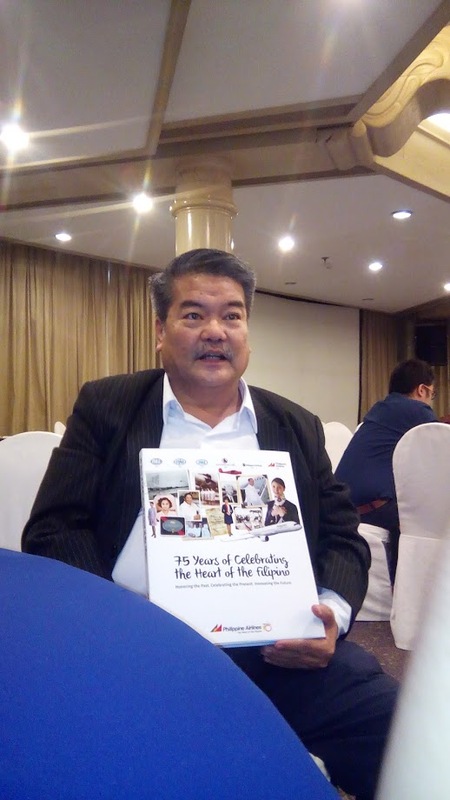 Last Friday, I had a chance to join the launching of PAL's coffee table book to commemorate it's 75 years of service. It was all about honoring the past, celebrating the present and innovating the future. I feel that along with other passengers who flew through Philippine Airlines, I am part of this coffee table book too. Actually, every Filipino is part of PAL's history and this coffee table book because this is the flag carrier of our country. Not to mention that Philippine Airlines is the very first established airlines in the whole Asia! What's inside this coffee table book of PAL? This is a book containing 200 pages of great illustrations paying tribute to the people behind this airlines: from the pilot, to the cabin crews, mechanics, cleaners, check in agents and so on. This also tackles the evolution of their flights and the many good causes they serve to less fortunate people during calamities and medical needs. Chapter 1: A Partner in Nation's Progress. Sharing the famous personalities that PAL flew: from Philippine presidents to the two most recent Popes. They call it as VVIP's (very, very important persons). transformation from its logo to the types of the fleets they use. Dr. Lucio Tan's story, who rescued this once dying airline business is found here. This chapter made me salute all their pilots and crews for passing a very tough and diverse training. The meals served up in the air inside Philippine Airlines isn't just prepared by an anonymous cook. These are created by top chefs like Bruce Lim, Ben Lam, Jill Sandique, Fernando Araca etc. The anatomy of a PAL flight is discussed here. All the technicalities and a long checklist of keeping everyone safe while thousands of miles up in the air, you'll read here. This is my favorite chapter. Here you'll read how PAL flew a future Saint to the Philippines, a PAL employees who started a family tradition of working for decades in this company. During typhoon and other calamities, PAL is always there to fly volunteers and relief goods to the needy ones. I must admit I felt goosebumps when I saw Mr Lucio Tan myself. He is a very successful businessman behind Philippine Airlines from Fujian, China. He is a true representation of a person bridging the gap between the Filipinos and the world. He is my idol as a top notch entrepreneur. PAL isn't resting its accolades yet and continues to strive even more. Here, you'll read the countless plans that Philippine Airlines want to do for the next years to come as a brand. Joining the launching of Philippine Airlines' coffee table book is also like finding my way to a history class again. I've learned quite a lot actually, that Philippine Airlines was once the only designated airlines in terms of local flights during Marcos regime and that the very first lady Pilot in Asia is a Filipina flying PAL planes named Aimee Carandang. I regretted not asking a photo of her, just realized it now. She was there to grace the occasion too along with a priest who was the son of the very first guy pilot of Philippine Airlines. Of course, the last person whom I would like to give credit for the PAL's official coffee table book is no other than Mr. Jonathan P. Gesmundo, he is the brain behind this book. We were able to chat with him personally and I was really moved at his efforts to have Rebecca “BECKY” Verzosa - Santos, the first ever international stewardess of Philippine Airlines who served alone on the epic first transpacific flight of PAL to fly home weary American soldiers after World War II to get in touch with her. He even went to New York to make a video of her last October but she was ailing already and by December she had her last flight back to the Creator. I feel really lucky that my PAL coffee table book have been personally signed by Mr. Jaime Bautista and Mr. Jonathan Gesmundo. This makes my copy even more precious having the signatures of the top PAL officials. I am keeping this safe! You can buy your own Philippine Airlines coffee table book, just head to the official Facebook Fan Page of PAL Boutique here for only Php 1,975. Every purchase benefits the PAL Foundation. You can visit PAL Boutique at the PNB Financial Center, Pasay City. Photos credit to Mark Conrad Maramag of planyourtripnow.